A glimpse is obviously not enough to gorge on the rich history of the college, but Ramjas College’s Grand Centennial Celebration is right around the corner as they complete a hundred years in 2017 and we decided to take a look at the past. 1. The college was founded by Rai Kedarnath, a philanthropist, who created the college for the lower middle class students who couldn’t afford the education in other colleges. Admission of students was solely on the basis of merit and no student was discriminated or denied admission on the basis of caste. All you needed to be at Ramjas was a will to study. At first, the college was run by the Ramjas Foundation, that was meant for schools and educational institutions, but later, it got affiliated to the University of Delhi . Ramjas College is one of first three colleges that were established in Delhi University. 2. Ramjas was the first college to run their classes in shifts. This started due to Partition and the morning classes were affiliated by the University of Delhi and the evening classes were affiliated by the University of Lahore. The college provided accommodation for many refugees from Pakistan, however students were having troubles in commuting to the college. So, Rai Kedarnath went to ask for donations from people in places like Chandani Chowk and made sure that every student had one bicycle for commuting. 3. The provision of bicycles led to the start of another trend. In order to earn money, students from Ramjas delivered door-to-door newspaper service on the cycles. This was the first time that something like this happened in Delhi. 4. The students of the college were actively involved the freedom movement and a group of students were arrested for their involvement in the struggle. A plaque with their names inscribed on it has been put up near the college auditorium gate in memory of the brave students. Two students, Ram Bihari Mathur and Saxena, were sentenced to life imprisonment and shipped off to Andaman. 5. Ramjas College’s involvement with the freedom struggle is extremely memorable. Chandra Shekhar Azad hid in the hostel of the college, pretending to be a Sikh student from Pakistan, when he was evading the British Government. 6. Ramjas College location was shifted from the Anant Parbat location in 1950, when the previous building was ceded to the Allied Forces of the World War II. The first President of India, Dr Rajendra Prasad, inaugurated the college’s new location. 7. This is the only college in Delhi to have Dr. BR Ambedkar as the Chairman of the Governing Body of Ramjas College. After the death of Rai Kedarnath, the father of our constitution took over and honoured the college. Ramjas not only has a rich past, but a very exciting present. 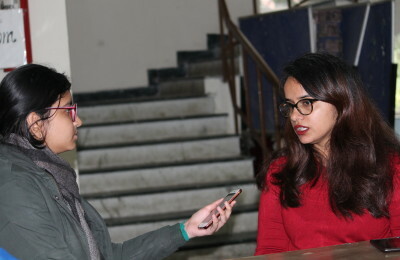 With alumni including film-maker Prakash Jha, actor Manoj Bajpai and singer-musician Papon, the college is a place for budding artists, politicians and activists. A huge congratulations to the college for its glorious 100 Years!